There has been many demolition projects in California.Two of the main demolition projects have been the process of two projects that will take a couple of years to be completed. The first project is the beginning of demolishing buildings in Central Valley. Recently a building in Fresno was demolished in preparation for California's High Speed Rail Construction. Many more buildings will be demolished as time passes in the Central Valley where the high speed rail will pass through a 29 mile segment. The second project will be completed in about two years from now. A couple of days ago, a shopping mall is coming down slowly in Sacramento and will be transformed into a new arena for the Sacramento Kings. As time passes by many buildings will be demolished, mainly the easter section of the Downtown Plaza shopping mall. There is a lot of work to be done because the building is intended to be open in October 2016. These projects are exciting and the development process is as exciting as well. However,the preparation of these demolition projects takes time to plan out because it is a sophisticated business done by professionals who are highly trained experts. During these two projects safe work practices will be used that protect everyone involved in the project and the environment. There are several common misconceptions of demolition. 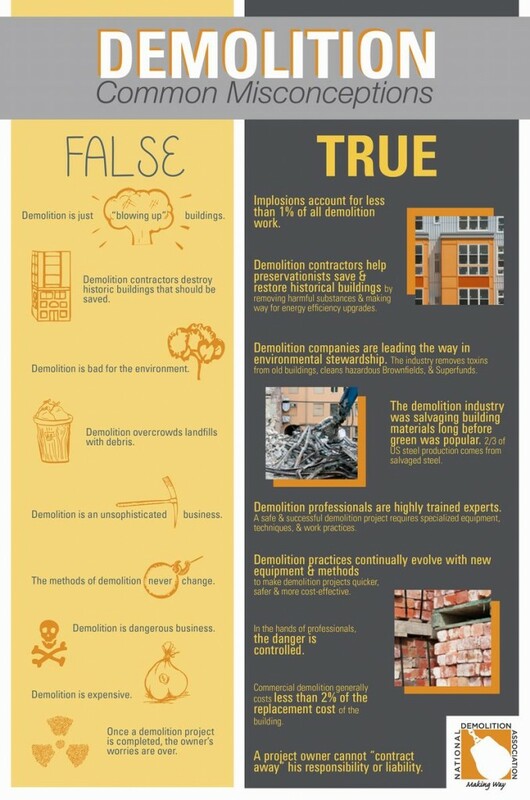 Our friends at Demolition Association created a visual on false and true facts about demolition. To learn more about the demolition services we provide contact us. Alliance Environmental is a licensed California-based demolition contractor capable of handling most structural demolition projects, from taking apart all or part of a particular structure to clear the space it is built on, to renovating the demolished part of the structure.